Seattle, WA - May 04th, 2018 - The second in a unique series of early-reader (age 0-5) bedtime story books aimed at introducing kids to motorsports culture is available today, published by TunersCare.com. 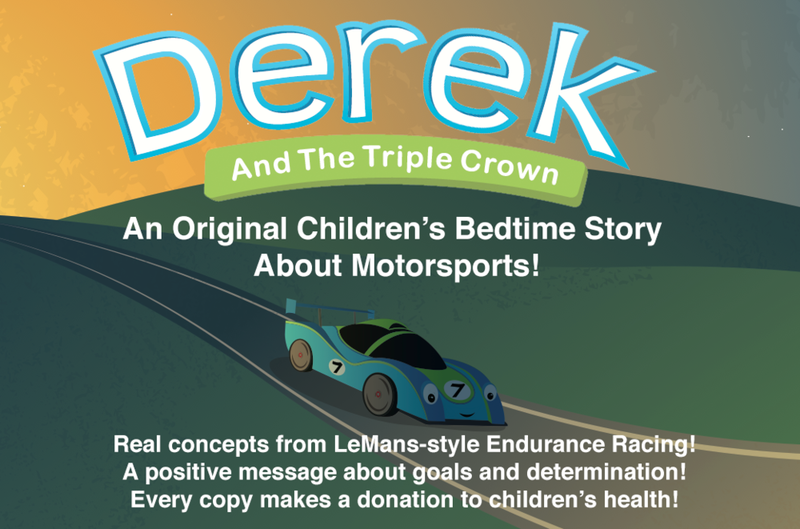 The follow-up to "Nicky Is Stanced Out"; this book - "Derek And The Triple Crown" - follows the adventures of Derek the LMP1 race car as he attempts to fulfill his dreams of becoming a Triple Crown champion. Written and illustrated by long-time car club and motorsports enthusiasts, these stories have a gearhead twist but still feature a positive message with broad appeal, and every book sale includes a donation to children's health charities. The story is published in hard back format and is in-stock now, having just arrived from the publishing house. Digital copies are also available formatted for iPad and Amazon Kindle via Amazon.com. Hardcover editions are printed in English; Kindle e-Book editions are published in both English and Spanish. Retail pricing for a hard cover copy starts at $14 USD which includes shipping anywhere in the USA. International orders have an additional shipping fee depending on destination, including discounted shipping for Canada and United Kingdom customers. Details about the book are available at: https://www.tunerscare.com/derek including ordering information. More information about the charitable donations is available at: http://tunerscare.com/charity. Amazon ordering, including Kindle digital editions, is available at: http://stanc.me/derekonamazon.